A lot of those language tools polls have some odd results, so I’m glad you pointed that out. Rapid Miner’s UI is confusing to me. However, the best thing about RapidMiner is that the founder of process mining and his other researchers made an extension to RapidMiner that integrates ProM (the only advanced…research level… process mining tool on the market), and RapidMiner’s UI is much better than the native ProM. Can you point me to the Power BI python announcement? 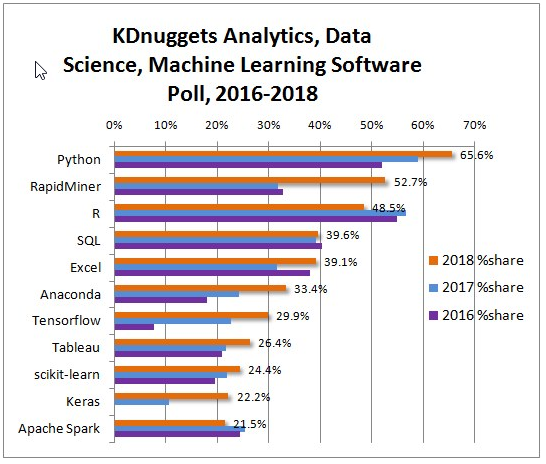 I asked Devin Knight about a python Power BI tie-in last month and he didn’t know about it (or maybe he was being coy, not being sure if he would violate any NDA’s, by telling a class about this). I would be happy to point you to the announcement which was made here http://geni.us/eJBRAS The announcement that Power BI would be including Python was made on March 28. It’s difficult to keep up with all of the new Power BI information, but I am happy to publicize it as it is not under NDA. Thanks for the great comments! I’m going to update the post to embed the link just in case people don’t scroll down here.